It’s not every day that Industry Canada goes on a campaign against a major industry. And it’s certainly not every day that it happens under a Conservative government. 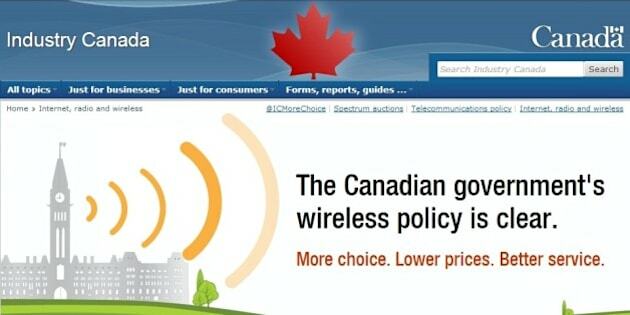 But the department’s new public relations campaign, More Choice, is a frontal attack on the Big Three wireless companies, and the claims they have been making in public about Canada’s wireless industry. A new website hosted by Industry Canada lists six “fictions” that it says the industry has been telling Canadians, including that the government’s rules favour foreign firms; that there is already enough competition in the market; and that jobs would be threatened by foreign competitors. It’s part of a campaign that includes radio spots, newspaper ads and a Twitter account, and at times the tax-funded PR effort walks a razor-thin line between public service message and political campaigning. “The Government has taken action and new competitors have emerged. Canadians now have more choice. Prices have fallen by almost 20 per cent and jobs in the wireless industry have increased by 25 per cent,” the site states. As the Globe and Mail points out, there may be something fundamentally unfair about Industry Canada’s campaign. The Big Three wireless companies, as bidders in the 700 MHz wireless spectrum auction, are restricted from talking about the auction publicly. “We were surprised to see that the government has launched this campaign. We're not sure how this benefits Canadians or how it helps the government achieve its goal of a more competitive wireless sector,” said Ken Englehart, VP for regulatory affairs at Rogers, as quoted at the Globe. The silence clause is a condition put into place to ensure collusion doesn’t take place between bidders. Presumably, it also means the Big Three can no longer run their coordinated “Fair for Canada” campaign, launched last summer to pressure the government to change the wireless auction rules. That campaign launched while rumours abounded that Verizon was interested in setting up shop in Canada. Verizon ended up backing out (some argue because of the Big Three’s campaign), and no foreign companies placed deposits for the wireless spectrum auction to take place in January. The Harper government seized wireless competition as an issue over the summer, with both Prime Minister Stephen Harper and Industry Minister James Moore at times wading into wars of words with the Big Three. According to the National Post’s John Ivison, the Tories are planning to take on the airline industry this fall with a “passengers’ bill of rights” and will also take on the U.S.-Canada price gap, which may prove a tough issue on which to make any progress. In a sign of just how fully the Harper government is working to recast itself as pro-consumer, Industry Minister James Moore appeared last week to praise a policy put into place by Jean Chretien’s Liberal government that restricts corporate donations in elections. Moore told an Ottawa audience that, as industry minister, he has come to realize the value of the ban on corporate donations. “(W)e can now make policy decisions that are in the best interest of all Canadians and are not beholden to the pressures of the political finance,” Moore said.